It's been a few days now since we arrived here at our temporary home in Bad Doberan, a small town in former eastern Germany close to the Baltic sea. 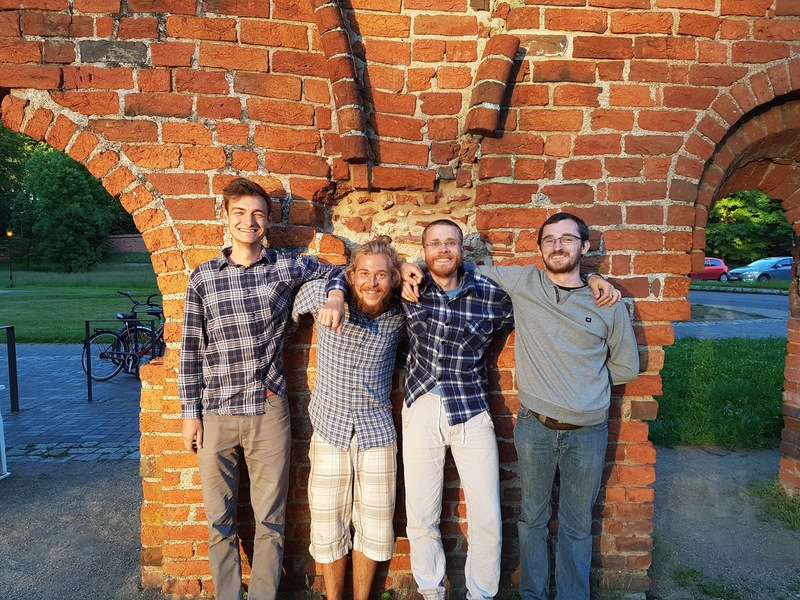 Each of us came on his own way : Stanislaw had 28 hours of bus from Taize to Hamburg (then the train), Felix took 3 days to go hitchhiking, Elie came threw Germany only by "regional" trains and Nikolas had a direct train. Most of us arrived on Sunday and from the very beginning, we had a warmly welcoming from the local parish, with a barbecue (and it won`t be the last one). Most of us didn't know each other or the place before going on this adventure. But talking about we and us all the time, maybe we should first introduce ourself? My travel started 24 years ago in Hildesheim (Germany). Since then I try to follow the way of my heart. I'm 24 years old and I'm from a small village near Bordeaux (France). It has been three years since I got my sound engineer diploma, but so far I had a lot of different jobs and occupations in my life (social worker, waiter, supervisor in a highschool). That's why I let my place in order to be a volunteer in Taizé for few months. Now I'm up to make this year as meaningful as possible. And I like music (all kinds), walking around and potatoes. I`m 19 years old from Hamburg. Before coming here I was a volunteer in Taizé for two months after quitting my studies of physical geography in January. "But why did you choosed to go for such an adventure?" you may ask. And it`s a good question ! This are some of the reasons we could imagine from our expectations. But the true value would reveal itself afterwards, when each one of us will realize how much he received. 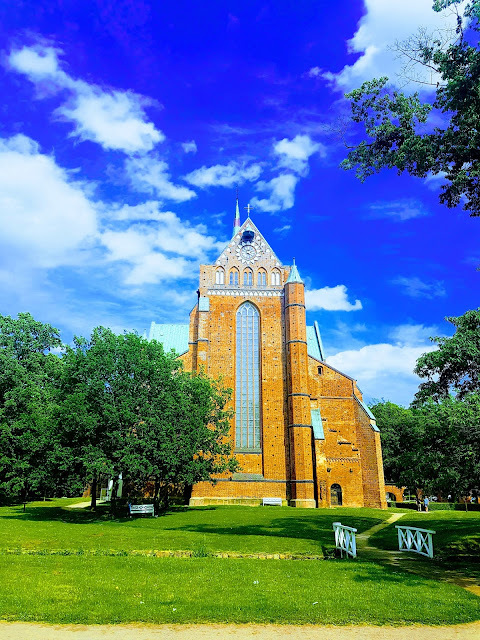 We were welcomed in the lutheran parish of Bad Doberan called "Münstergemeinde". The community is centered around the more than 600 year old minster which was the place of daily prayer for the cistercian monks that founded this settlement until the 16th century. The church is full of rich furnitures founded from donations of some high dynasties threw the ages ; a lot of dukes (and any kind of noble people) got burried in a luxuous grave there. The name Doberan, originally Dobran, is a place name that probably derives from a Slavic Old Polabian personal name, meaning "good" (dobry). According to legend, the name Doberan originated when the monastery was being built. It is said that a passing deer startled several swans, who shrieked with terror "dobre dobre". Whereupon the monks called the place Doberan. Even today, a deer and swan adorn the arms of the town. Since the 18th century, the city is aknown for a bathing resort. We four got our beds in one room in an old house opposite of the minster, in this same house also two refugees live together with us. 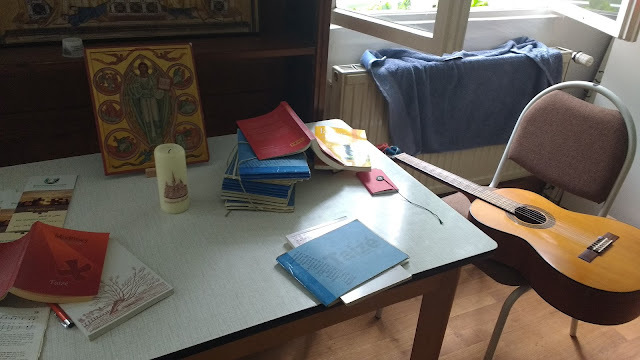 In the footsteps of the past monks we will have three prayers each day and spend our days helping the parish in their multiple social projects and in regular community life. Until now we spent the days helping in the soup kitchen, the community garden, the local youth club or helping a family of refugees moving into their new home. But we will give you some news in the nexts posts !